The next generation tuner/pitch pipe! Does singing or playing musical instrument play a part in your life? If so, let this app to play a part in yours! The one and only direct pitch to staff tuning and staff to pitch tone playing app. PitchMe is complete pitch checking and tuning solution for singers and instruments. Advanced chromatic tuner works with variety of instruments and human voices. Display detected pitch on a grand staff along with the classic pitch meter. Includes an innovative pitch player that can touch play piano straight on the musical staff! Supports full range of key signatures, transposition and A4 frequency calibration. Supports Solfège, both movable and fixed. At a cost less than that of a single sheet music, you'll have uniquely powerful music tool. Never guess what pitch note is on a sheet music. Never guess if you are singing in pitch of a specific note. 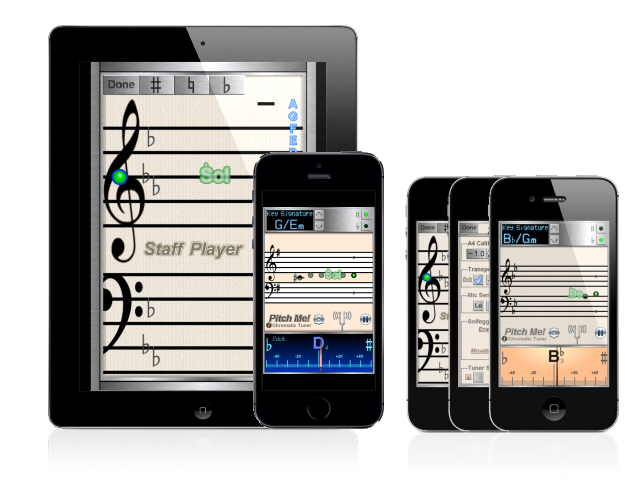 For choir, play your score notes instantly. Use it to transcribe melodies. Perfect tool for song and music writers. Use it to learn scales and solfeggio. Optimized for variety of complex harmonics such as human voice, strings, and wind instruments. Detects: voice, guitar, piano, violin, cello, flute, clarinet, saxophone, horn, trumpet and more.